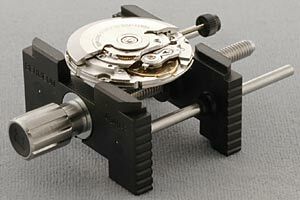 This reversible movement holder for 8 3/4 to 19 ligne movements is the Bergeon, Swiss-made classic. 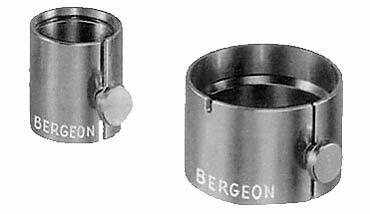 Bergeon has improved on the design of the popular 4040 movement holder. 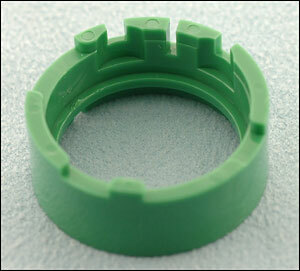 Using hardened plastic instead of steel, this eliminates potential scratching of the movement. Holds movements from 19.75 mm to 42.85 mm. 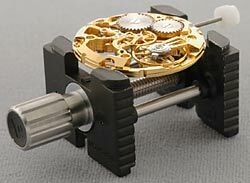 This reversible movement holder for 8 3/4 to 19 ligne movements is the Bergeon, Swiss-made classic. Holds movements from 19.75 mm to 42.85 mm. 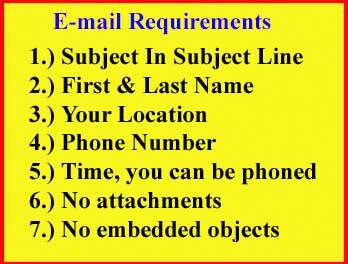 It's as servicable as any other and at a very good price. 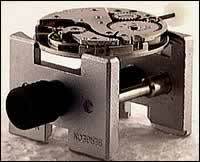 This holder is like the FB-807, but accomodating movements between 3 3/4 and 11 lignes. 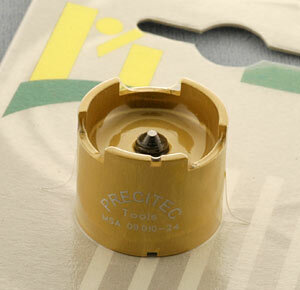 Holds movements from 8.46 mm to 24.80 mm. Accomodates movements between 3 3/4 and 11 lignes. 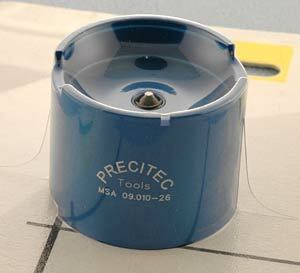 Holds movements from 8.46 mm to 24.80 mm. Made with hardened plastic to eliminate potential scratching of the movement. 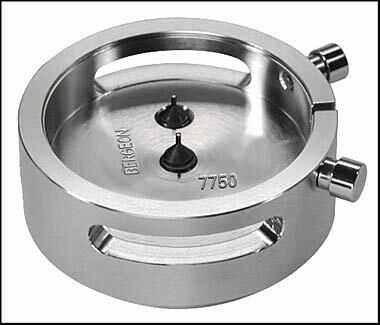 This is a good-quality Bergeon holder for larger movements, Tightening on Ø external from 25 to 62 mm. Nickel-plated brass. Round shape. Dimension: base diameter at 31.0 mm. With 2 support screws in tempered steel, 1 at the center and 1 at 12 o’clock. 2 pushers at 2 and 4 o’clock without gasket, weak spring. 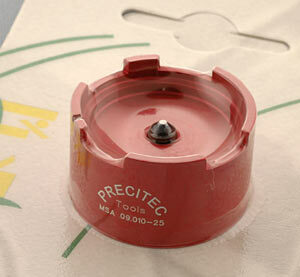 Similar to the FB-804, this holder accomodates baguette ebauches and smaller movements. The notches provide clearence for the stem. 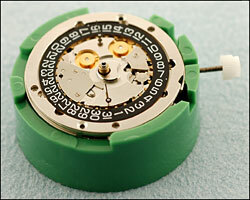 Plastic green reversible movement holder 13 1/4 ligne for the Valjoux 7750. Plastic green movement holder 11 1/2 ligne for the ETA 2824 and Sellita SW200-1. 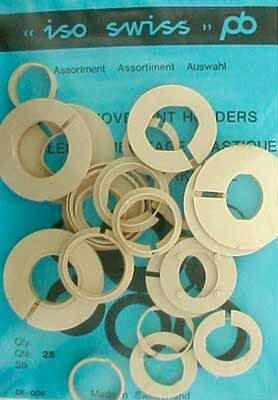 These plastic holders are tapered, round rings for holding movements from 7 1/2 lignes to 22 1/2 lignes. 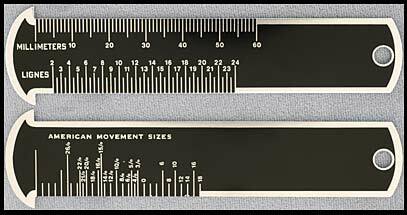 Gauge measures in watch lignes sizes and millimeters on one side, while the other side gives American watch movement sizes. 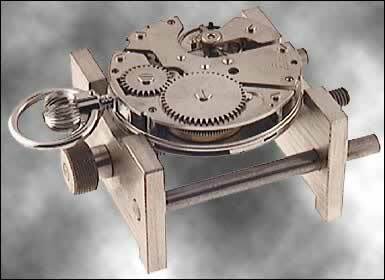 For measuring the diameter (0 to 60 mm) or the number of ligne sizes (2 to 24) of a movement. 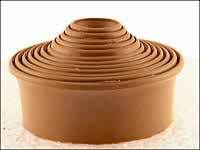 Length: 108 mm. Click Here For special Movement Holders that will work with or without the Multi Function Press. In sizes from 4 1/4 ligne to 22 ligne. 25 piece assortment. Made in Switzerland.